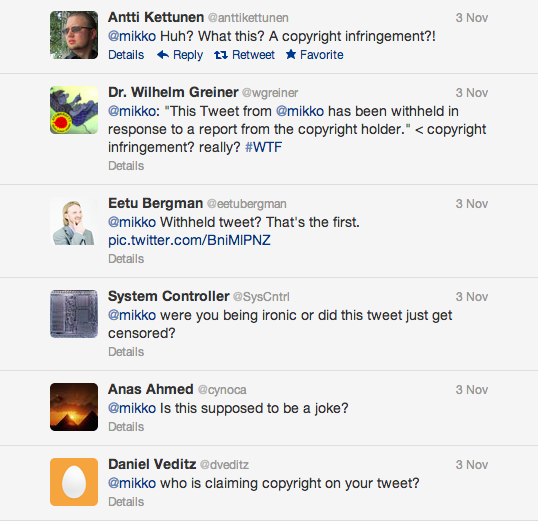 Twitter has made a significant shift in how it responds to copyright complaints. In the past, such complaints caused tweets to vanish without a trace but now people can see the place where a tweet once stood — and the reaction to its disappearance. For the purpose of this story, Mikko’s prank is unfortunate but should not overshadow the bigger implication of Twitter’s new policy: tweets subject to a copyright notice no longer go down a memory hole. This is important to reporters and scholars who use Twitter as a news source and now have an explanation when a piece of news vanishes due to copyright reasons. The tweet announcing the policy suggested it was in the name of “#transparency.” This is consistent with other efforts by Twitter to shine light on a copyright process that critics say is susceptible to abuse by content owners. In January, for instance, Twitter published 4,410 DMCA takedown requests it received in the previous year. The DMCA refers to a law that gives internet companies like Twitter or Google immunity for copyrighted material posted by their users. To preserve this immunity, they have to take down users’ material when they receive a notice from a copyright owner; the target of the notice can then send a counter-notice saying the material should not be taken down. The new Twitter policy comes as both internet companies and copyright owners are growing frustrated with the existing DMCA regime. On one hand, content creators say it is too much effort to track and send DMCA notices for each infringement. On the other hand, rights owners may be growing trigger happy with notices; Google (s goog), for instance, is now receiving more than 1 million copyright requests a month, some of which are not justified and can create a “chilling effect” for users. As Jim H. said, I’m not sure how a 140-character message can violate copyright beyond perhaps the link being to copyrighted material. If that’s the case, it would seem more sensible to go after the source of the content, not the reference to it. That would seem to be about links, primarily, so my initial question stands. With the world more connected every day, trying to take down every link seems a bit over the top when its the source that matters. Misuse of copyright is the main reason why copyright laws will be changed in the near future. It never is a good idea to make a complaint the reason to withdraw a tweet. The same kind of misuse is in UK with libel-laws. Very frustrating in all senses. How in the hell can a 140 character text message infringe a copyright in any meaningful way? Because it links to copyrighted material, I would assume. I disagree, what is being taken down based on copyright provides additional (and important) context.